« Very Little Generation The Next Several Days! This wonderful weather in December was a nice Christmas present! We have had days in the 50s almost 60s most of the week. Mornings have been a little cool, but if you dress for it and wait out the day, it has warmed up! Yesterday was awesome! Today will be nice, but they are predicting some pretty strong winds. It’s 8:30 and already it is 40 degrees and lots of sunshine. 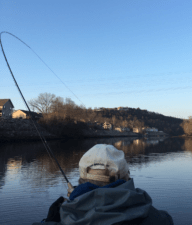 This will be one of the warmest New Year’s Days the gals from the River Runners Women’s Fly Fishing Club have spent on the water. It’s supposed to b e in the mid 50s Sunday. We’ll take it! Generation has either been off all day and coming on for 1-2 hours late in the afternoon, or running 1-3 units for 2-03 hours in the morning around 7:00, then off the rest of the day. Today it is off and not scheduled to come on until 5:00 p.m.
Tuesday, Stan took Kevin out for half a day. 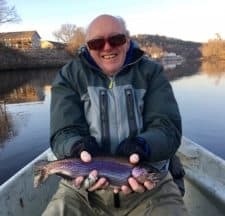 Good day for Kevin on the Ruby 2 midge. The water turned off just before they hit the river, so there was a drop most of the trip. Good bite but a little cool when they got there. Sun never came out so thank heavens for temperatures in the 50s. colors of egg patterns, the white mega worm and the ruby 2. It was one of those days where fishing was slow for a while then took off and back to slow then take off,…. What a way to end the year!. 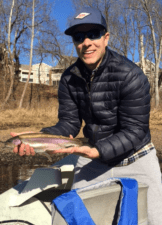 This entry was posted on Thursday, December 29th, 2016 at 10:09 am	and is filed under Fishing Reports. You can follow any responses to this entry through the RSS 2.0 feed. You can leave a response, or trackback from your own site.